The reported unemployment rate for older workers often looks better than that for younger workers. Today’s March employment report shows an unemployment rate for workers aged 55 to 64 of 3.9%, an increase of 0.1 percentage points from the February rate of 3.8%. While older men’s unemployment stayed the same at 4.0%, older women’s unemployment increased from 3.5% to 3.8%. However, older workers don’t always have an easy time finding jobs. Since the economic recovery starting in 2009, the labor market for older workers has recovered less robustly than for younger workers. The headline unemployment rate (referred to as U-3) understates the true level of unemployment by only including those actively looking for work in the past four weeks. A broader measure of unemployment - called U-6 - includes both part-time workers who would prefer a full-time job and workers who would look for work if they thought they could get a job (including discouraged workers who have recently given up looking for work). Economists consider U-6 a good measure of slack, or excess supply, in labor markets. 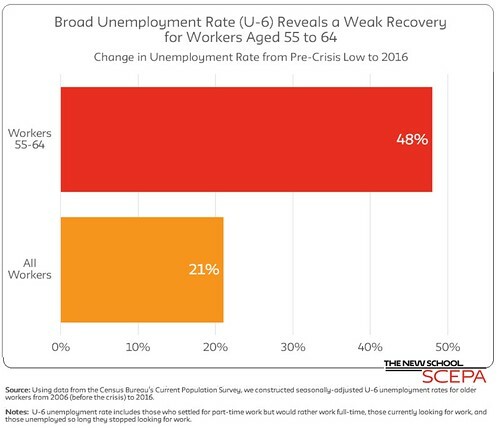 The more inclusive U-6 unemployment rate for workers aged 55 to 64 shows a weaker recovery after the Great Recession. The February 2016 rate of 6.5% (the most recent data available) remains 48% higher than its pre-crisis low of 4.4%, reached in December 2006. In contrast, U-6 for all workers is only 21% higher than its pre-crisis low reached in March 2007. Two important factors contribute to older workers facing particular difficulties in a recovering labor market. First, older workers are less likely to switch industries relative to prime-age workers. Second, older workers experience longer average spells of unemployment than prime-age workers. Advocates for cutting Social Security benefits by increasing the retirement age point to headline unemployment rates, which have nearly returned to pre-crisis levels, as evidence that older workers can delay retirement. But the U-6 unemployment rate for older workers suggests otherwise - that delaying retirement is not a one-size-fits all solution for those nearing retirement age without enough retirement savings. Rather than forcing older workers to fend for themselves in an unfriendly labor market, we need Guaranteed Retirement Accounts (GRAs) to allow workers a safe, effective vehicle to accumulate savings over their working lives so that those with limited labor market options can retire in dignity.